“When the restlessness of the mind, intellect and self is stilled through the practice of yoga, the yogi, by the grace of the spirit within himself, finds fulfilment. Then he knows the joy eternal which is beyond the pale of the senses which his reason cannot grasp. He abides in this reality and moves not therefrom.” B.K.S. Iyengar – Light on Yoga. Yoga is traditionally a spiritual science evolved over centuries to help us all deal with the dilemmas of human life. Since the propagation of its teaching in the western world, a variety of styles have been developed; some more dynamic, others more restorative, and everything in between from yoga and dance, to sleep yoga, laughter yoga, and yoga therapy. While this diversion is often critiqued within the yoga scene for diluting its original essence, all these practices offer powerful tools to access the power of yoga as a whole (maybe leave out cat yoga and beer yoga, I don’t really know what all that’s about). Ultimately, yoga is a word that means different things to different people, but what connects practitioners around the world is the shared journey of discovering a deeper sense of connection and awareness within and of oneself. The role of yoga as a practice, then, is to provide the individual with the tools to reach this unified state of body, mind and soul. We are all driven by the desire to feed the body and mind what it needs to feel good, and deep down we know that means treating ourselves with wholesome love and respect. That’s why, actually, your yoga journey begins the moment you decide to start taking better care of yourself. Some people start yoga to develop strength and flexibility. Others come to relax and unwind. But overall, the focus is on taking responsibility for our own health and wellbeing. For me, it started when I surrendered to my heart’s whisper for peace, before I stepped on the mat for the first time. I’d always been someone to test my own limits and push myself as hard as I could, but my soul was tired and cried for a break. So when I decided that yoga classes would help me balance my need to move and my need to regain my strength, the path of compassion and letting go was already underway. My first class was a vinyasa flow class at the university gym, and boy! I felt it the next day. But it was the connection to a joy within myself that exploded as I breathed to the beat which kept me coming back. Over the past five years, what began as a practice of mindful movement has continued to carry me from that first breath on a journey into stillness. And hence I find myself sharing what yoga is, not just to me, but for she who continues to search for it until she rests therein. I’m 24 years old and I still don’t know what I want to be when I grow up. I wonder if I’ll still be asking myself the same question when I’m 50. The trouble is, what you want is always changing and it’s impossible to know if what you think you want is actually what you want until you try it. So more recently, I’ve stopped asking myself where I want to go, and started tuning in to what is right for me, now. They told us ‘choose a job you love and you’ll never work a day in your life’, as if it was that easy. As if we’re born with some sticker stuck to our forehead that says something like, ‘Passion: Sports, Purpose: PE Teacher. But of course it’s not that straightforward, because you’re more intricate than a simple walking machine with a passion and a purpose. I always believed in solving problems and helping people. I wanted to give my life to a cause and I felt compelled by a strong sense of duty to use my gifts to make the world a better place. But building the skills and experience takes time. So how do you figure out what you enjoy doing enough to dedicate a large chunk of your life to? For me, the important thing I have learned is not to think about where I want to be, but to look at the opportunities that are around me and consider what I would enjoy. That means identifying my strengths, interests, and values, and aligning those core attributes with the mission of a company and the job role it offers. When you are clear on your values, and you’re looking for work, you can then ask yourself, “OK, does this match up?” And if it does, why not go for it? The trick is not to think too far ahead about where you might end up, but to ask yourself what is right for you now. If you are able to align your strengths and interests with something society values, you are already in a good place. With time, your own pattern of interests will become clear as you continue to follow what speaks to you now. So keep moving with these questions and answer truthfully. What are my strengths? What do I enjoy doing? What values does society hold that I can contribute towards? What is important to me? And do I need to make changes in my life to align my values and interests with what I am actually doing day to day? But also remember to make the most of time outside of work to be with family and friends, travel and play, learn and grow, or whatever it is that brings you most joy. Because your life is not a duty, it is a celebration of what and who you are. I hope you find everything you are looking for and more. I absolutely love it here. I love the warmth of the summer air and the charm of this ancient city that melts my heart as it wraps its arms around me. I love the language, the landscape, and the oh so french culture of appreciating good food while sipping from a glass of wine on the terrace. I love the people and the family of friends I have made as they welcomed me into their home. I simply love France. The past three months have flown by in a turbulence of home hunting, job searching, and dating random french men who wanted to brush up on their English. I suppose its only natural to experience feelings of anxiety in such a situation of change, even in a place I adore. But this feeling of apprehension for a life in France is something I thought I’d look into. Having felt into what is important, family and friends, work that I enjoy, and time and space to practice and teach yoga, I know it would make my life easier perhaps to come home. I mean, it was a romanticised idea to work in a cafe in France and teach some yoga classes on the side. The french cafe culture is very different to the British coffee culture, and there’s simply not enough work going round in small city centre like Montpellier. But I have a job, I have somewhere to live, and I’m just about scraping by financially for now. I’ve met some wonderful people who continue to support and inspire me, and I know what I want. A few weeks back I booked a flight home to the UK, but as the time to leave approaches nearer, I am starting to realise just how much I want to stay. I want to stay in France and teach yoga. So let’s try. Let’s at least try. Because I love it here, and I’m not ready to give up. It’s not necessarily easy, but it’s where my heart belongs. All I need is a little bit of patience, faith, and confidence in what I already have to share; My journey, my experience, my knowledge, and my love and support for your health and happiness. It’s time to let go of what I thought life had in store for me and flow faithfully into what I will inevitably become, without resistance, without haste, but in truth of who I am and what delights my soul. If it really doesn’t work out for whatever reason, I can always come back home. But the start is often the hardest part and sometimes we have to fight our way through the brambles to reach the clearing in the woods, where we can lie down and surrender to the skies above. When I finished university 2 years ago, I decided I didn’t want to get a ‘real job’. I wanted to create a social enterprise to share yoga as a tool for students and young people to deal with the rising problem of mental health, and set myself on the task to build an organisation. 10 weeks in to the project I was struck by an existential realisation. I had weathered three years of intermittent anxiety and depression, and yoga helped me more than you could know, but I still had so much to learn before guiding others on their own journey. It was then I decided to take a step back and relaxed into enjoying the practice for my own personal self discovery and growth. Over the past 18 months, as I have been reflecting on the direction I want my life to take, a fair amount of my enquiry has been exploring the foundations of what actually makes us happy. Meaning and purpose being a key component, it makes sense to think about what is important. But recently, I read an article which again put to question the idea of happiness itself, and made me wonder if the search for happiness might actually be a paradoxical pursuit. When I was talking to a friend about this, we admitted if you have to ask yourself if you’re happy, you’re probably still looking to fill at least one of the boxes on the happiness check list. The reason this article challenged me though, is because it described how happiness became a cultural obsession with the decline of religious belief and the rise of economic prosperity. For me, the capitalist bubble we have inflated around ourselves definitely begs the question of what really matters in light of infinite possibilities to create a ‘flourishing’ life. The modern concept around happiness is about feeling good, as opposed to a more old fashioned belief in being good. Aristotle argued that happiness is an evaluation of a life lived well, resulting not from the intangible measures of a life’s quality but from living a life of virtue, epitomised by characteristics such as humility and devotion, strength and courage, honesty and integrity. In contrast, today’s world seems confused by the notion of happiness as if it is somehow a measure on our success when the pertinence of financial rewards is constantly being put in to question. But the real reason this modern concept of feeling good is imbued with potential paradox is two fold. Firstly, if happiness is a feeling then its acquisition would be impossible to sustain. Feelings are conscious emotions that arise through our mental reaction to life events. Because life is changing all the time, these feelings come and go, and in this sense, happiness isn’t something we could restrain any more than we would want to release our sadness. But the desire to be happy is a very real phenomenon. The second paradox follows then that it it this very attachment to wanting to be happy all the time that counteracts the kind of happiness that arises when we put our selfish desires to bed. Oh, and if you want to read the article I mentioned, follow this link. Today I am glad to celebrate International Yoga Day. More than a day for millions of people to be grateful for what yoga has offered them, today is a day for us all to connect and be reminded of what matters for everyone. So why does yoga mater? Whether you choose to see it or not, we live in a world of crisis. Social inequality and environmental exploitation mixed with economic instability calls on the aid of non profit organisations across health and education, arts and culture, humanitarian relief, and environmental conservation to rally support from the masses. But individuals are in crisis, too, because you see, this ‘reality’ we have created is not conducive to human flourishing. Perhaps it is this disillusionment which drives us either to the brink of insanity or compels us to act. But what can we do when we are working in a system that has got itself tangled in one big mess? How do we balance what we want with what we can have, and assess what we need with what is available? More than a set of physical exercises, Yoga is a path of harmony and grace that shows us not only what we need but how to find it. The trouble for most of us is we are so confused by our own existence that we don’t know where to start looking on our quest for understanding ourselves and the world around us. We think we have to chase material success for security, comfort and social acceptance. We deal with what we want now, but lack presence with ourselves and the people around us. We think we or someone else will deal with the consequences of our actions today if and when it becomes a problem tomorrow. But what we lack is a true understanding of where we are now in relation to everything that exists around us and how to navigate our way through the complexity of a system that we have built up around ourselves. Whatever makes the world go round, it’s not money. I’d say it’s love, but it might be something different for you. But whatever it is, it’s not money. It’s not greed. It’s not hate. It’s people, it’s relationships, it’s this desire to connect, to serve a purpose and reach our highest potential. We just got confused somewhere. If you take money away, people will still find a way to share their gifts with one another, because we desire to connect and support one another to flourish for our own survival. We are not an independent species. We are a social species. We survive together, or we don’t survive at all. Think, if you were the only person left on this planet, what would you stay for? No man’s an island. So you see, if we can learn to sync with what we need right now, we’ll realise we have everything we need, either within or around us. We see that the most important thing is to act in love to support one another, rather than grabbing what we can get for ourselves. When we start to see and understand how everything is connected, we have a stronger desire to protect the people and the world around us. Even though we know we have the capability to destroy, we choose to create and sustain, because we think before we act, and we act responsibly for ourselves and others. This is yoga. Harmony, clarity, connection, and love. Yoga means understanding our place in the world, and connecting with the divine source of creation within each and everyone of us that beckons to be set free. It means putting aside our selfish desires and learning to serve our planet with humility. Yoga. Forgetting and remembering who we are, to rediscover what it means to be with ourselves and the world in an effortless dance that takes away the floor and leaves us waltzing in the clouds. And why this day is just as important for you as it is for me. Because today you might come across someone who by their own light inspires your own to ignite. To connect, to journey within and find what you need to make the world a better place. It was a good life. I’d been out of uni for 18 months and in that time I had completed my yoga teacher training, worked as a fitness instructor, and gained 12 months sales experience with a company I really love. I was earning decent money and enjoying Leeds where I could pretty much do anything I wanted in my free time – I don’t ask for much apart from good friends, yoga and food! If I’d waited a couple of months, it wasn’t long before I might have moved into a different role with the company in London, where many of my good friends are also living. Everything was running pretty smoothly and I was on a good track. But I was restless, and the job I was doing wasn’t stimulating enough for me to bear another few months when I had more exciting ventures to pursue. Daydreaming in the office, my mind would wander to the yoga classes I wanted to teach, the projects I wanted to run, and the places I wanted to go. At some point I had to ask myself when I would stop daydreaming and actually go out and make it happen, so when I realised that what I really wanted to do was to travel, immerse myself in yoga, and write, that’s what I did. I booked my flights to India, and set off for 12 weeks, where I had the most amazing and profound experience learning not just from great teachers, but from life in the country itself, the people I met, and the challenges we faced together. I thought I would be ready to get back to ‘normal life’ when I returned to England, but I’d got out, and I didn’t want to get stuck again when there were other places I knew I wanted to be. I don’t know why but I’ve always wanted to live in France, so again I asked myself, “if not now, when?” The time is always ripe to live your life the way you want it to be, so here I am. The plan is to work in hospitality/teaching English while I build my yoga profile, but every day that passes still with no job security, I have to ask myself if I’m knocking on the right doors, and if I’m not, where should I be knocking? I would launch myself into teaching yoga full time if I wanted to make a business out of it, but I don’t; I’m not going to start chasing money from yoga at a time when making money actually is my priority. The truth is though, I am confident that I’m where I’m supposed to be right now. Montpellier doesn’t feel like somewhere I have chosen to be as much it feels somewhere I have been led to, as if life is waiting here for me. So I will keep waltzing patiently, faithful that the clues are in the dance itself. So long as I stay present, so long as I surrender to the dance, so long as I feel for the gentle push and pull of the one who leads me, I will always be where I am supposed to be. Time. We see it running away from us sometimes when we feel stuck where we are. We try to claw onto time, because there’s somewhere we want to be, or something we want to achieve, and we always seem to want to get there as quickly as possible. When I meet people who are running their own businesses for example, I always want to know how old they are so I have some sort of landmark as to what I might be able to achieve by the time I reach the same age. But actually, time is a pest, like that person who keeps reminding you of your next deadline when you’ve still got TIME. You know something needs to be done, and you’re doing it, but come on, can I just do it in my own time, please? The reality is though that we are in fact bound by time. I made the move to France 11 days ago, because it felt right at the time. 11 days isn’t long, and I don’t like to rush because it stresses me out, but I do have to find a job pronto as I currently have just £300 to live off until I am paid, presuming I get something before my THIRD lot of rent is due on the 1st July. The pressure of time puts me in a situation where I might not find my ideal job, and yet they say that ‘destiny is what you create for yourself, and fate is when you fail to create your own destiny.’ So, will I create my destiny, or do I fall victim to fate? Honestly, I don’t think it matters. The fact is that both destiny and fate are two sides of the same coin. At whatever point you find yourself in life, it is the result of both things that have happened to you, and things you have made happen. Neither our destiny nor our fate escapes us. We do have to be aware though of when is the right time to create our destiny, and when is the right time to let fate take its course. Overall, I know the destiny I want to create, but right now I need to find a way to live in France. I do believe the opportunity that presents itself to me will be my fate, and I choose to accept it. I mean, what could be so bad? After all, wherever we arrive, we are always free to fly again. The magic is in the movement. If you set yourself in motion towards the direction of your goals, you will at some point definitely arrive. But the true beauty is in the journey, and living the story of it all fully; without haste, reading carefully word by word, in complete acceptance of where you are now, and excited to see where you will be when you turn the page. I’ve been in Rishikesh for almost two weeks now, and having attended just one yoga class in the whole time I’ve been here, I feel a reflective blog post is due. Rishikesh is without doubt a very special place. It welcomes in yoga practitioners and soul seekers from all corners of the world, hosting more teacher training courses than you could begin to imagine within these hills that rise above the sacred River Ganges. Magnificent temples line the banks around the areas of Ram Jhula and Lakshman Jhula, and another array of ashrams are scattered in the appropriately named Swarg Ashram. In it’s raw beauty, the spiritual essence of this place is powerful. I’ve had a daily yoga practice for the past four years, but my meditation is only just starting to develop, which has been greatly supported by the whole atmosphere here. Though the streets are loud and crowded with tourists from India and beyond, slip away down a quiet side alley and you’ll find yourself on the water’s edge with the mountains rising above you and the noise dropping off behind. It’s here where I find myself resting peacefully in silence and alive with divine inspiration. I haven’t been actively searching out yoga classes in Rishikesh, partly because finding the few that work for me would be like looking for a needle in a haystack. Undoubtedly, there are many great yoga teachers here, but I’m only around for a short time and what I’ve come to realise is that actually finding a teacher in India probably isn’t going to serve my practice all that well in the long run. When I came out here, I thought I might find someone who I would continue to practice with for years to come, but after two months of intensive study with a handful of inspiring teachers, what I feel I need now is to digest everything I have learned so far as I continue my own practice in pursuit of an ever more intimate awareness and connection with my own being. 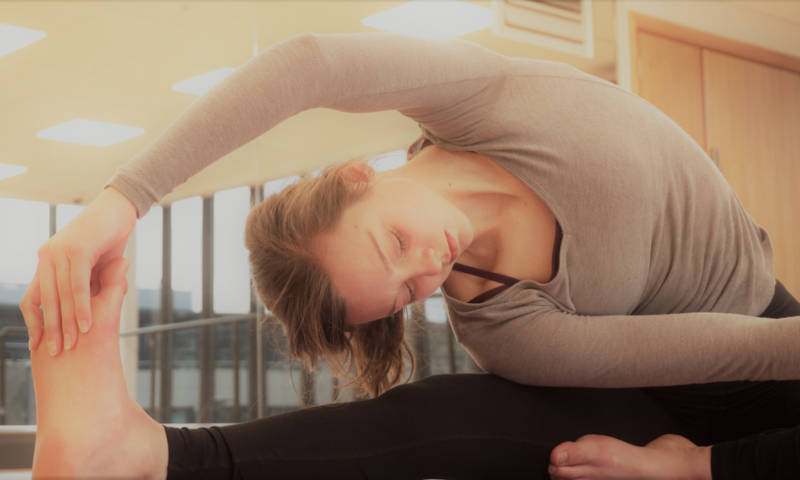 Initially, finding a teacher who can truly guide your enquiry in yoga might prove difficult, but there is one person who you can always learn from, and that’s yourself. The yogic lifestyle is important because it cultivates a healthy body and mind through which we can work towards a higher state of positive being, but no one call tell you exactly what you need to do to realise it. You see, no one knows you better than you know yourself, and yoga is but a journey of self discovery. Every individual and their journey is unique and we all have different paths to take, but if we create space in our lives to sit silently for a while, we create space to observe where we are on the road, from where it began and to where it leads. The clues to guide us on our journey are always there, suspended in the mind and body oceans which encompass our existence. A yoga teacher can provide a ship for your adventure and teach you how to sail, but it is the wisdom of the soul within that will reveal these lessons to us at the right point along the way. We must simply be present and still where we are to see them as the ship passes through. How much time and energy do you think you waste thinking over the same issue again and again? For me, it’s a lot. Anyone whose ever had the unfortunate experience of shopping with me will know how awful I am at making decisions. If I’m scouting for shoes, I will spend an hour trying on 10 pairs and walk out the shop with none. If it’s food shopping, even if I write a list beforehand, I will go around the store 10 times until I’m sure I have everything I need/want. The problem is, I get so distracted by all the choices that I start to question if the option right in front of me is what I really want, or if there is something better available that I should perhaps consider. I call this the problem of choice. If we analyse decision making behaviour, any individual will fall into one of two categories. Either you are a satisficer or a maximiser. The satisficer will opt for ‘good enough’, whereas the maximiser will try to assess the outcome of every possibility to rationalise which option will produce the best results. In this day and age, you might think maximising tendencies are preferable, because we always strive for the ‘best’, right? But let me tell you, I have always been a maximiser and it’s really quite unhelpful. The reality is that our minds cannot possibly pre-empt the outcome of every possibility because our knowledge is limited. So where a maximiser will battle with more intense feelings of FOMO (fear of missing out) in the decision making process, satisficers are blessed with greater feelings of contentment and are less likely to kick themselves when they realise they could have made a better choice. So, when faced with making an important decision, remind yourself what you really need/want from the outcome. Maybe there are three key aspects to consider. For example, I’ve decided to move to France this summer, but honestly I was going round and round in my mind trying to decide which exact spot to choose until my mind was silenced by an intense back bending practice this morning and I realised it doesn’t actually matter where I live as long as it has the main things I am looking for, i.e. is there a good community of down-to-earth young people? Is it an attractive place? And is it close to nature? Once you have found an option that meets your key requirements, go for it and don’t look back. This way, you’ll experience less anxiety in the decision making process and will be more open to making the most of wherever you end up without regret. Afterall, what can you do with all your thoughts anyway? When did thinking about something for days on end ever actually get you anywhere? So save your mental energy and spend more time enjoying the moment you are in. Whatever happens, it will all work out for the best in the end. Your story is already written. You just have to live it.